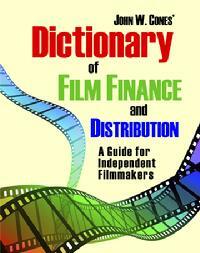 New Film Dictionary Helps "Level the Playing Field"
Most independent filmmakers have a limited knowledge of the law and, thus, are at a disadvantage when it comes to negotiating the financing and distribution of a film. But a new book that defines more than 4,000 terms associated with film finance and distribution seeks to "level the playing field a bit," according to its author. "The large film studios and theater chains employ attorneys and others who are experts in negotiating film contracts," writes Los Angeles film attorney John W. Cones in the Introduction to his new book, Dictionary of Film Finance and Distribution: A Guide for Independent Filmmakers. "In contrast, most independent filmmakers and producers have limited knowledge of the law, in part because the schools and universities that educated them stress the technical, creative or production side of filmmaking, not the business side. One consequence of this disparity is that independent filmmakers and producers are usually at a disadvantage when it comes to negotiating the financing and distribution of a film." "I wrote this dictionary to help fill this void," says Cones, who has been called the nation�s foremost legal advocate for independent filmmakers. "More specifically, my goal was to help level the playing field a bit when it comes to negotiating financing and distribution of films." In addition to defining terms, Cones' 526-page dictionary also contains a list of "Terms Associated with Motion Picture Production," two essays on "337 Business Practices of the Major Studio/Distributors" and an "Overview of the Motion Picture Industry," and an extensive bibliography. Cones says "the information in this book should prove valuable to a wide range of people seeking to independently produce a film, including attorneys, distributors, executive producers, producers, associate producers, studio executives, screen writers, directors, exhibitors, broker/dealers, money finders, accountants, auditors, investors, profit participants, federal and state government officials and film students." About the Author: John W. Cones is a securities and entertainment attorney in Los Angeles, where he advises clients who produce independent feature films, videos, television shows and plays. He has written nine other books about Hollywood, including Hollywood Wars: How Insiders Gained and Maintain Control Over the Film Industry (Marquette Books, 2007), and he lectures frequently on film finance and distribution.